Networking and informational interviewing are important tools in the job/internship search. Networking is a process of building relationships that provide you with advice and information. This could allow you to tap into unadvertised opportunities. Informational interviewing is part of the networking process and is a way to build your network. Why are Networking and Informational Interviewing effective? Networking and informational interviewing work because they are proactive and driven by you. Networking and informational interviewing allow you to get your questions answered by the people who have ‘insider information’. This could include information on vacancies, industry or organizational culture, and required skills. Recruiting is a resource intensive activity for employers. It takes time and money to advertise job openings, read resumes, interview candidates, and negotiate oﬀers. A potential word of mouth recommendation from a contact within your network saves you and the employer time and resources. One of the best ways to connect with Columbia alumni is via LinkedIn. Many alumni feel a strong association with their alma mater and would be happy to speak with you and provide advice. For students who have graduated, check out the Alumni Community which includes a University-wide alumni directory available through the Columbia Alumni Association. You may reach out to industry professionals with whom you might not have a direct connection. Determine if there are any connections through your own immediate network or Columbia network. Gather contact information and email them through their companies or send a message via social media platforms. There are thousands of groups on LinkedIn bringing together professionals in various industries. Search broad areas of interest and ﬁnd groups on almost every career! MentorNet matches professionals with students in engineering, science, mathematics, and technology. Many professional associations oﬀer student discounted memberships which, will give you access to conferences, networking events, job boards, and the latest industry information. 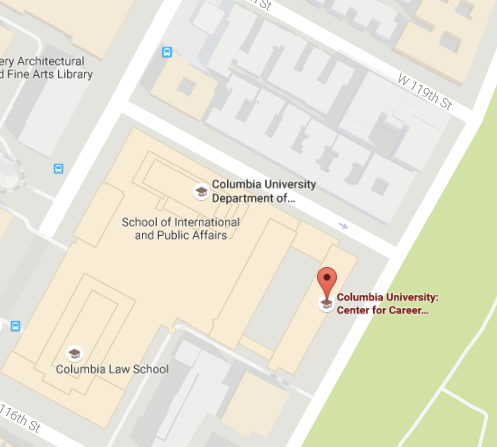 Columbia has a full list of professional associations (Columbia Chapters) available online. The American Society of Association Executives (ASAE) oﬀers an online “Gateway to Associations Directory” which takes you directly to many of the associations currently operating nationally and internationally. Meetup.com is the world’s largest network of local groups. The site makes it easy for anyone to organize a local group or ﬁnd one of the thousands already meeting up face-to-face. More than 9,000 groups get together in local communities each day, each one with the goal of improving themselves or their communities. Search Career, Business, and General Interest Meetups for events of interest to you in your area. Volunteering on or oﬀ campus is a great way to build your experience and your network. Volunteering brings together groups of people from diﬀerent backgrounds, ﬁelds, and experiences. One way you can ﬁnd opportunities on campus is by connecting to Columbia Community Impact. More than 950 Community Impact volunteers operate 25 programs serving more than 8,000 people each year. Oﬀ campus, New York Cares, NYCService.gov, or Idealist.org can help to connect you to opportunities. You may run into unexpected situations while networking, here are some ways to overcome common obstacles. Feeling uncomfortable - Networking and informational interviewing are means of career exploration and job searching. It is likely that your contacts will have networked themselves, will applaud your initiative. Remember that networking helps both parties! If you do your research, you may also be able to share information that beneﬁts your contact. Long silences — Refer to your prepared list of open-ended questions that cannot be answered with a yes/no response. Rude responses -Thank the contact and, if necessary, end the conversation early if you receive a rude response. Run-on answers — Refocus the interview by stating that you don’t want to take too much of their time, and ask another question from your list. You ask for a job and the conversation ends — Networking is best used to develop relationships, not to locate job leads. Use networking meetings to gain information, develop further contacts, and seek advice to improve your job search. You are being interviewed - If an actual job is presented to you, you may choose to be interviewed formally on the spot. In this case, it is appropriate to ask more questions about the job before answering interview questions.